Former regional rivals, Iran and Iraq are going through hard times. Half-ruined after the US invasion, Iraq, that has just rid itself of the ISIS nightmare and not without help from its eastern neighbor, is trying to consolidate its domestic political life and start economic recovery. Plagued by financial and socio-economic problems as a result of toughening US sanctions, Iraq is looking for ways to weaken foreign pressure and survive under crisis conditions. These circumstances are pushing both countries to develop mutually advantageous and multilateral ties in an effort to overcome difficulties and create a more stable situation in the region. Iranian influence is playing a noticeable role in Iraq’s domestic political and economic life. Tehran rendered effective aid to Baghdad in establishing combat-capable paramilitary units for fighting ISIS units, which enhanced Iran’s political influence there. After the toughening of US sanctions against Iran, Iraq has become one of Tehran’s major trade partners. Iran supplies its neighbor with badly needed electricity, gas and oil as well as agricultural products. Iraqi banks have amassed substantial Iranian financial assets and Iran views Iraq as a major channel for financial settlements with those countries that continue cooperating with Tehran despite the threat of US secondary sanctions. During Iranian President Hassan Rouhani’s official visit to Baghdad in March, the two countries signed a number of memorandums of understanding on energy, railways, healthcare, security and the mutual easing of visa procedures. These issues were discussed in more detail during Iraqi Prime Minister Abdel Abdul-Mahdi’s recent visit to Iran. All this indicates that Iraq has no intention of joining anti-Iran sanctions and become an instrument of pressure on Tehran. In response to the US demand to stop energy cooperation with Iran, the Iraqi authorities respond that cessation of such cooperation before the full recovery of the domestic energy system may lead to public protests and destabilization in the domestic arena. In this context, Iraq insists that the US extend its permission for the continued sale of Iranian oil as part of the exceptions from the sanctions. 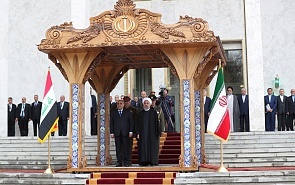 A change for the better in the general atmosphere of bilateral relations is evidenced by the fact that during his stay in Iraq, President Rouhani was received by Iran’s supreme religious authority, the Ayatollah Ali al-Husseini al-Sistani, alongside meetings with the country’s leaders and representatives of Sunni parties. In 2008 and 2013 Ayatollah Sistani avoided meeting with then Iranian President Mahmoud Ahmadinejad during his visits to Iraq. The spiritual leader of the Iraqi Shia and other Iraqi leaders announced the importance of developing constructive and neighborly ties between the two countries based on mutual benefit. Referring to Iran’s role in fighting ISIS on Iraqi territory, Ayatollah Sistani emphasized the importance of respecting the sovereignty and non-interference in each other’s domestic affairs. This could be interpreted as a warning to Tehran against excessive involvement in Iraq’s domestic affairs and at the same time as a signal to Washington not to be too concerned about “Iran’s dominance” in Iraq. Obviously responding to US statements that a US military presence would remain in Iraq to monitor Iran’s actions, Ayatollah Sistani noted that US troops would remain in Iraq to train and advise its military, and that Baghdad would maintain a balance in its relations with Iran and the US. Thus, Iraq intends to maintain this balance in relations with the US and Iran without allowing Tehran to seriously interfere in its internal affairs but at the same time not becoming dependent on the US in its bilateral relations with Iran. In principle, Baghdad will not exacerbate relations with Washington in the hope of retaining financial aid for domestic economic recovery. For the same reason, Iraq won’t side with anyone in Iran’s geopolitical confrontation with the Gulf countries, especially Saudi Arabia. Baghdad considers it a safe role to be a mediator and a venue for coming to a consensus, a kind of a modus vivendi in Iran’s relations with its Arab neighbors. Russia is also interested in this. It is doing what it can to relieve tensions between countries of the Middle East and to stabilize the situation in the region.